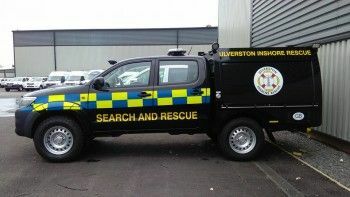 Ulverston Inshore Rescue received a grant of £5,000 from the Cumbria Fund to purchase equipment for their new rescue vehicle. The rescue organisation used the funds to purchase a winch, roof rack, internal storage boxes and a rear access ladder. They also fitted the vehicle with a new radio and GPS gear. The crew’s previous vehicle was over twelve years old and was not fit for purpose. The new vehicle is capable of carrying more equipment and can tow the rescue boats nearer to the sea rather than the crew having to drag them over long distances. Ulverston Inshore Rescue provide an essential lifeline to anyone in peril on the Morecambe Bay sands. They receive an average of 18 call outs per year. Due to the recent loss of a lifeboat at Barrow, Ulverston Inshore Rescue now have to cover a larger area and are expecting the number of call outs to increase. The new vehicle and the extra equipment to go with it will be invaluable to aiding these rescues. Patricia Prosser, Secretary to Ulverston Inshore Rescue, said: “ This grant has enabled us to increase our capabilities and continue to support all emergency services and the general public during a crisis; ultimately saving lives.